This speaker cable embodies Black Rhodium's pioneering spirit with its cryogenically processed design. This cable is the first to showcase the brand's exclusive Crystal Sound process. Black Rhodium Solo DCT++ CS Speaker Cable - Terminated Pairs punches well above its weight by delivering a robust sound performance usually found in much chunkier cables. A testament to the brand's pioneering vision, this cable features a deeply cryogenically treated design that truly enhances the depth, timing and clarity of your music. What's more, the Solo DCT++ is the first Black Rhodium speaker cable to utilise the brand's exclusive Crystal Sound process. This results in a much more regular and closely packed cable surface, which aids conduction and continuity. The Solo DCT++ draws inspiration from the award-winning and highly popular Twist, Twirl and Samba, so you can be assured of a high-performing cable. SOLO DCT++ CS is enhanced with Black Rhodium's pioneering DCT++cryogenic processing treatment.This process involves processing temperature both above and below room temperature. The DCT++process edits the molecular structure of the cable in order to improve uniformity. 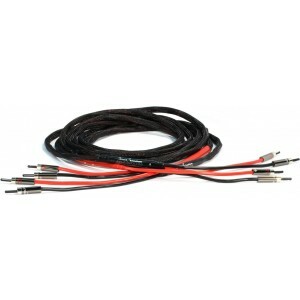 This brings long-lasting benefits and quite simply, improves every aspect of the cable's performance. The Crystal Sound process is applied to the cable after the completed DCT++ process and works to refocus the most external conductor skin. As a result, the surface of the conductor closely packed and uniform, with a continuity which helps conduction. With the Crystal Sound process, bass notes are demonstrably enhanced the overall sound clarity is improved. 'Transient Phase Distortion’ is lessened by the utilisation of thicker insulation than you usually find in speaker cables. This feature increases the distance between conductors and consequently reduces the magnetic field seen in each conductor wire. As you can imagine, the benefit can be heard in a clearer and more expansive sound quality. SOLO DCT++ CS is double coated in a sleek black outer nylon braid, obtained specially by Black Rhodium cables from a UK supplier. This imbues the cable with sophistication, while glossy Black Rhodium directional heat shrink labels offer the cable the finish it deserves.